Ogwen Cottage Outdoor Pursuits Centre Team building activityOgwen Cottage Outdoor Pursuits Centre is situated in the very heart of the mountains of Snowdonia, one of Britain's most beautiful National Parks. Lofty peaks, lakes and rivers abound; a superb environment for learning in the outdoors. This is where the experienced Centre staff conduct their activity sessions. Ogwen Cottage Outdoor Pursuits Centre is situated in the very heart of the mountains of Snowdonia, one of Britain's most beautiful National Parks. 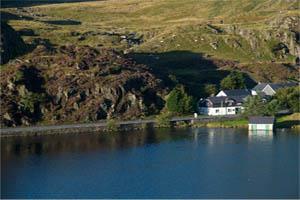 Ogwen Cottage is situated on the A5(T) at the head of Llyn Ogwen and the opening of to the Nant Ffrancon Pass. GR. I : 50,000 SH 1 15 650603. From the City of Birmingham follow the M6 North, then the M54 and then continue on the A5 (North Wales). Or alternatively from the M6 onto the M56 and onto the A55 (Chester to North Wales). The Centre is 4½ miles from Capel Curig. It is possible to catch a train to Bangor and arrange for Centre transport to collect a group from the station.